Not very many just yet but enough for our first salad last night. I planted a Seville variety out early in October and for the first year I'm harvesting the same week as the professional guys without the need to cover everything with plastic. Its an easy and unfussy plant to grow. They are planted 3cm under, 10cm apart and grow without any bother. First, stems and leaves together unfurl from the ground to produce a perfectly formed plant and when the sun starts to warm the white, spring scented flowers bloom attracting bees and butterflies and bumblebees. As the flowers die off, the baby pod forms and little by little you see the first beans forming inside. Its like watching the 4th series of Mad Men in slow motion and then you pop a fur lined pod and taste that first bean and you realise just why the aching back and dirty fingernails are worth it. The only great nemesis of the Fava bean is black fly and there presence is due to the hard determined ant. So how do you piss off determined ants? A magical fomula of diluted black soap and nettle tea, smothers all their spawn and gets those ants fuming. 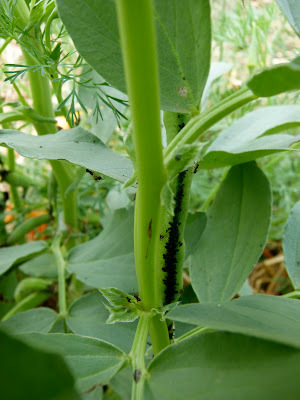 It easy enough to pinch off the tip where they like to hang out also but those ants will just lead their black babies elsewhere on the plant. Spray spray spray and smother the buggers. 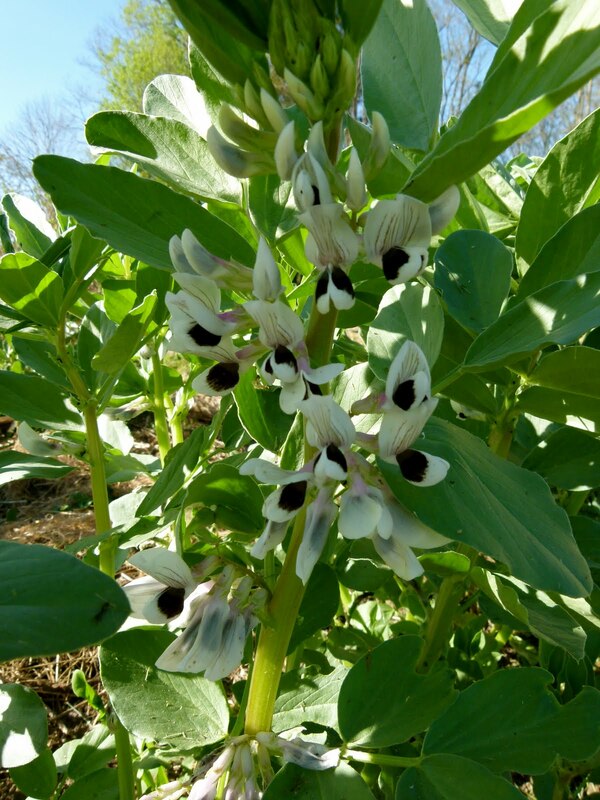 Broad beans are at their best when young and small. You can eat them raw or cook them for a maximum of 30 seconds in boiling water before pouring over a little olive oil and fleur de sel. Once they get bigger, the skins get tougher and its worth popping them out of of their parchment skins to reveal the bright green bean below. At this stage they are perfect for a risotto of a salad. Once they get older and more floury tasting I just keep them for soup or make a puree to serve with roast meat. Place the broad beans in a pan and boiling salted water and simmer for 30 seconds. Drain them and rinse in plenty of cold water. Remove the skins by gently squeezing them between your fingertips. Make a vegetable stock by heating the olive oil in a large pan and adding the onion, celery and chopped carrot. Cook together for a few minutes until the vegetables are softened without browning them. Add the thyme, bay and parsley and 1.2 litres of water. Boil and then simmer for half and hour. Boil some more water in a saucepan and add the broad beans. Cook for 1 minute. Drain and run them under cold water. Remove the skins. When the stock is ready, pass the liquid through a sieve into another saucepan and discard the vegetables. Add the rice to the liquid and boil then simmer for 20 minutes. Take off the heat and add half the beans and some salt and pepper and blitz the soup until smooth. Mix the yoghurt and garlic together in a large, heat proof bowl and add half the hot soup, little by little, so it doesn't separate the yoghurt with the change in temperature). Pour the yoghurt mixture into the rest of the soup and warm while stirring constantly without boiling. Add the rest of the beans. Season. Garnish in bowls with the lemon zest, dill and chervil and drizzle with a good olive oil.